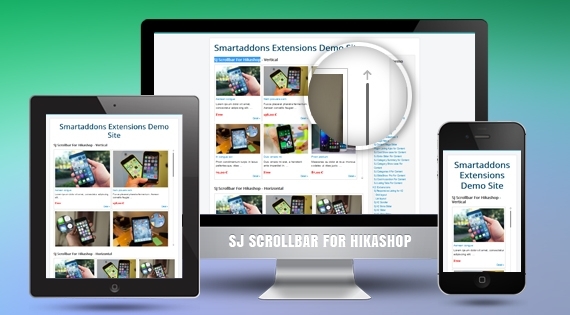 SJ Scrollbar for HikaShop is now placed on top list of Joomla modules for HikaShop component, compatible with Joomla 3.x. Good choice for item arrangement on frontpage by using mousewheel to control scrollbar. Take a look at our demonstration of this module, you will be attracted by 2 layouts available, which are Vertical and Horizontal. To be more specific, with Vertical layout, items are displayed in straight rows and columns within a single frame. Use mousewheel to scroll up and down to see items with high quality image, title, description, price and readmore link for each one. Coming along with item's title and navigation button, the chosen will be automatically spread out with preview image, description, rating, price detail and view more link if you use Hover. But in terms of Click, in order to see more details of each item, you need to click on favourite one, then information hidden inside will appear immediately.